“Then we race together. We can ride forever. Wrapped in horse-power, driving into fury. 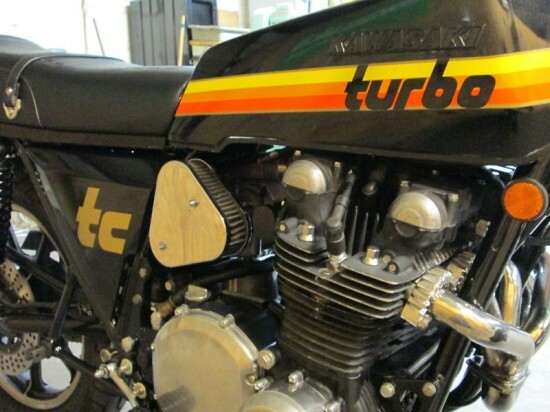 Changing gear I pull you tighter to me.” Is it just me or does it sound like Rob Halford was singing about the Kawasaki Z1r Turbo from 1978? I have only known about these bikes for about two years which seems like a disservice to me. I mean, shouldn’t somebody tell you these bikes exist when you buy your first bike or something? Maybe it’s the fact that I was born in the early 70’s and played Atari 64’s but there is something so perfect about the paint, turbo, 1000cc’s, the classic wheels and the squarish body work. This is not a perfect museum piece so maybe somebody can afford it. Here’s what the seller has to say. 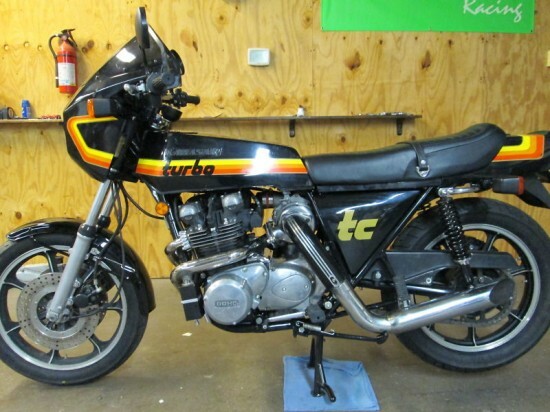 this a american turbo pac z1r tc.this one of the 250 built and sold through kawasaki dealer shipsthis bike has 14836 miles on her.the frame and all black parts are fresh powder coated,everything on this bike is new or rebuilt,many many $ for NOS parts.the orignal paint is ok the body does have a few scratches on it.the engine is fresh 1075 weisco.this bike comes with a spare body[fairing side panel are off of onther z1r tc,the rest is painted z1r parts],the seat is a reprodution,the extra strip set is from reprodution decals,every thing works very well.I will have a atp turbo kit for kz for sale later this week,with the spare body and turbo kit you can have an orignal and a clone,I might be able to help with delivery? meet 1/2 waywhat ever it takes.the extra chain gard shone is near mint condition,the 130/90 tire has rubbed the chain gard on bike[bikes came with a 120/80 not much tire]the last pic shows a copy of the orignal disclaimer from tcc and the date at which he bought the bike,he was 1/2 owner of the dealer ship,the other signer was the other 1/2 owner.Glenn is alive and well at 74 years of age and remebers the bike well. Have you ever had a 550 lbs bike do a power wheelie ? Me neither. Maybe this bike would let you sign that off your bucket list. If you’ve read any of my previous posts you may remember I own a 1977 KZ1000. My bike is very quick and I’ve had people on modern 1000cc bikes say they were wide open to keep up with me. The Z1r Turbo has 10 more horse power, a little more torque and does the 1/4 mile almost a whole second faster. Well, that’s according to the stock specs of both bikes. Kawasaki wisely added a dual disk set up to the front of the bike to help you stop all that weight and power. For me, this is one of the top ten Japanese bikes of the 1970’s. I can’t be alone in that thought because these bikes catch a hefty price tag. I have seen numbers in the $30,000 range. Maybe this will be low enough for you to scoop it up, yes, you. 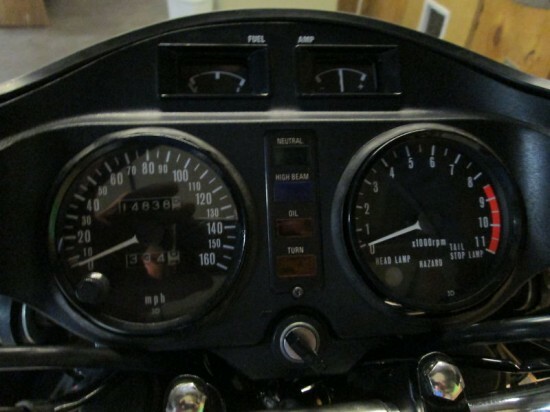 1973 Kawasaki H1D Mach III – 3 to Choose From! What’s an Atari 64? Do you mean Commodore 64, or maybe Atari 2600? Andy, thanks for pointing that out. I knew I should have fact checked my memory since it was thirty years ago that I was playing video games. It was an Atari 2600 that I played. The joy sticks were black with orange stripes.